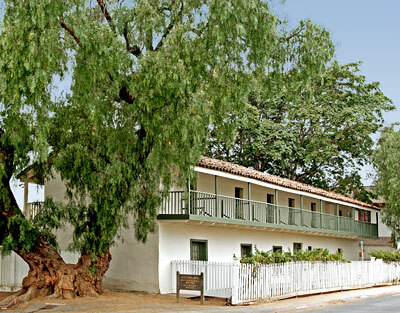 The Jose Castro House is a two-story adobe with tile-covered gable roof and plaster-covered adobe walls. An important feature of the house is its New England style timber frame. This combination of Eastern and Western building methods began in Monterey at the Thomas Larkin House, the prototype for the Monterey-Colonial architectural style so handsomely exemplified in the Castro House. The heavy timber frame not only allowed the construction of a second floor but also allowed the adobe shell to be lighter. Because much of the load is carried through the frame, the walls can be opened up a great deal more for windows and doors. Source: NRHP nomination submitted in 1970. 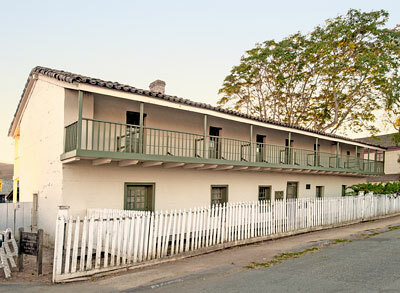 The castro House is also California Historical Landmark 179.